An interpreter accompanies each child who comes to North America for heart surgery through Samaritan’s Purse. Karla explains how this job is different from any other. Karla Patzi Cayoja has worked with the Children’s Heart Project in Bolivia on five separate trips with various families to various hospitals in North America. She most recently traveled with two Bolivian families receiving corrective heart surgeries in the Grand Cayman Islands. Being an interpreter for the Children’s Heart Project isn’t a normal job. It goes far beyond simply translating the right words from one language to another. During the time that I’ve been working with mothers, children, host families, and host churches, I’ve learned that God requires more than just a simple translation from all of us. Rodrigo with his mother in the hospital after his procedures. Working for this special project is a unique experience and a challenging opportunity to let God work through my life. It’s taught me that even in the darkest moments when it seems that everything is going wrong, God is there extending His hand, letting me know that I’m not alone. During a Children’s Heart Project deployment, it seems each moment is special and perfect for sharing the love of Christ. In every trip, God is seen through the kindness of people who open their homes and hearts for each group even without knowing them well. I’m thankful to be a part of such a wonderful community, a community where the presence of Christ can be seen and felt. 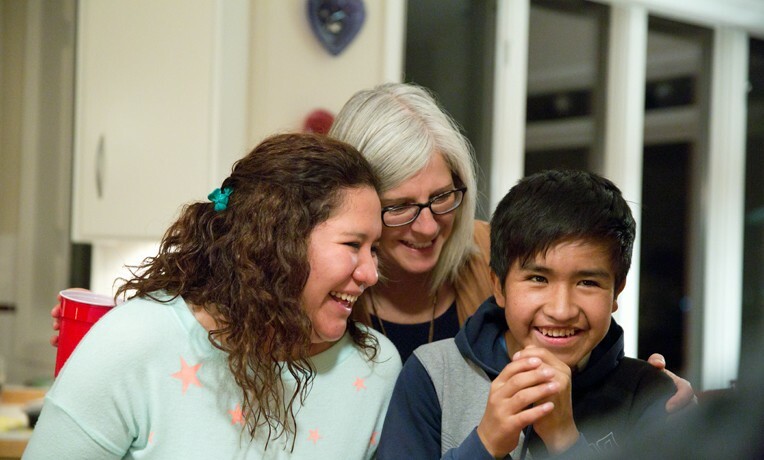 The Children’s Heart Project has a great impact in an interpreter’s life. All the children from the project have not only gone through health problems but also many other struggles in their homes. In the midst of these problems, it’s Jesus who transforms their lives from the inside out. He starts with their heart and later changes their whole lives. That’s the case for Rodrigo Quispe Alvarez, who lives in Llica, Potosi, a small village at 13,420 feet of elevation in Bolivia. He had more than 10 specific problems with his heart. He lived a life full of shame, depression, and sadness because of his condition. Rodrigo couldn’t understand why God made him that way and why he couldn’t be like other healthy children. One day, God answered his prayers, and a great adventure began. Rodrigo began to experience our awesome God in the middle of receiving complex heart surgeries in the U.S. and then walking through a painful and slow recovery. With each step he took, he knew that Jesus was sustaining him. Though he was afraid and experiencing a lot of pain, it was God who gave him peace that everything was going to be OK. There aren’t any words to describe the joy in the heart of an interpreter in seeing how these children and young people testify that God was the one who healed them. And it’s even more incredible when they accept Him as their Savior! Being able to be part of this experience in seeing new life and to have a new family with these children and their mothers is an incredible privilege. This is a precious ministry where I, as an interpreter, can be used as an instrument of God. I have the honor of being able to share these miracles that happen in the lives of every Children’s Heart Project family I travel with as an interpreter. It’s an incredible life experience that has changed me completely and has taught me to greater appreciate the gift of life. Indeed, this is not a normal job. The only thing I can do is give thanks to God for having chosen me to be part of expanding His kingdom. I surrender myself before Him, allowing Him to use my life to do things that I never would have dreamed were possible. Thanks be to Christ!